The most prestigious Swedish advertising awards Guldägget (the Golden Egg) were handed out last evening and several prizes were given to campaigns that involved social media. “If I should mention one trend then it has to be that the winning campaigns used a lot more of social media and PR than before”, said Digge Zetterberg, responsible for Guldägget at the Advertising Association of Sweden. Among the different social media tools, there is little doubt that Twitter has been the one that has gotten the most attention lately. Politicians, opinion leaders and now even businesses in Sweden have joined Twitter in hope of influencing key people in their target audience. 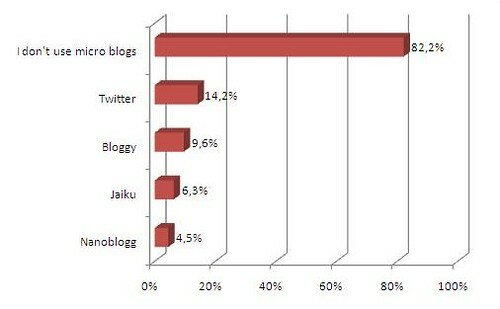 But micro blogging is still lagging conventional blogging, at least according to the results from my fourth annual Swedish blog survey BlogSweden 4/BloggSverige 4. I surveyed 1,500 blog readers in Feburary this year and more than 8 out of 10 do not use micro blogs. Twitter is the most popular of the ones mentioned in the survey and the local Swedish micro blog Bloggy has in a short period of time become more popular than Jaiku. Several also mentioned the status bar in Facebook as a micro blog tool they use. More results from the survey will be published here in the next few days.